Sichuan River (from the owners of A+A Sichuan in North Austin) has taken over the Tien Jin Chinese restaurant at 4534 Westgate Blvd (on the Hwy 290 eastbound frontage road at Westgate; same strip center as Black Swan Yoga and Sap's Thai). Can't say I had ever been to Tien Jin, but I have now had food from Sichuan River three times in two and a half weeks. My first time, I got eggplant in garlic sauce for carry out, along with the fried dumplings. My butcher friend had been there, and I thought he had said he had the eggplant with pork, which is what I asked for when I called. Turns out the pork isn't normally part of this dish (I've had it that way at Asia Cafe a place I really really like in far northwest ATX) but they had no problem adding it in. Verdict: thumbs up! Although after I had posted the picture on Facebook, one comment was that it looked like a dismembered Smurf. 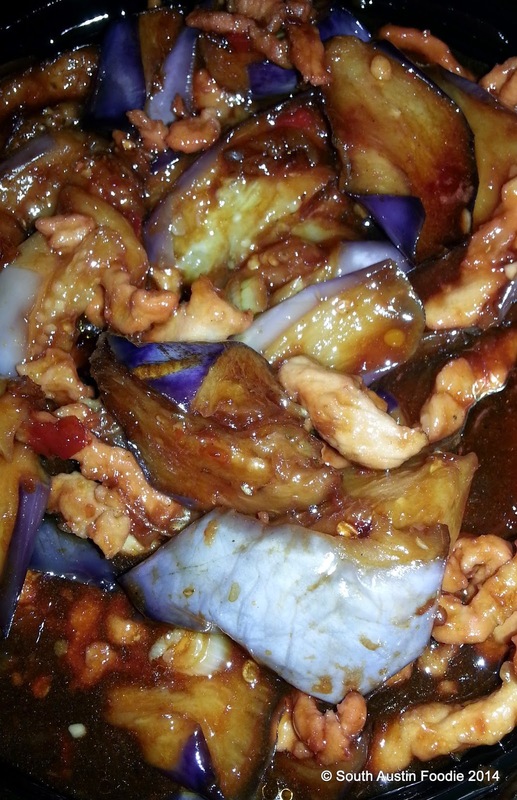 The eggplant is incredibly tender and the sauce was mildly sweet with a hint of a twang. The dumplings were a bit of a miss, but I am partially to blame, as they sat in a styrofoam container for 20+ minutes, and the ensuing condensation negated any crispiness that pan-frying gave them. I'd order them again, but only if I was eating there. On the plus side, the dough for the dumplings was much, much better than that at Asia Cafe, where it is WAY too thick, and the soy sauce-based dipping sauce breathed some life into them. Oh, and the eggplant dish, which comes with rice? I got three meals out of that! The second trip, I went to dine in with a Thai friend. She wanted to try some of the cold specialty dishes, namely pig ears and crunchy jellyfish, as she has had them in Thailand, and she wanted to see how they would compare. While these are not normally dishes I would go for, I was willing to try. And now I can say I tried them, and don't need to try them again. For some, I am sure they are wonderful. But for me, they were both very similar in texture: cartilaginous. 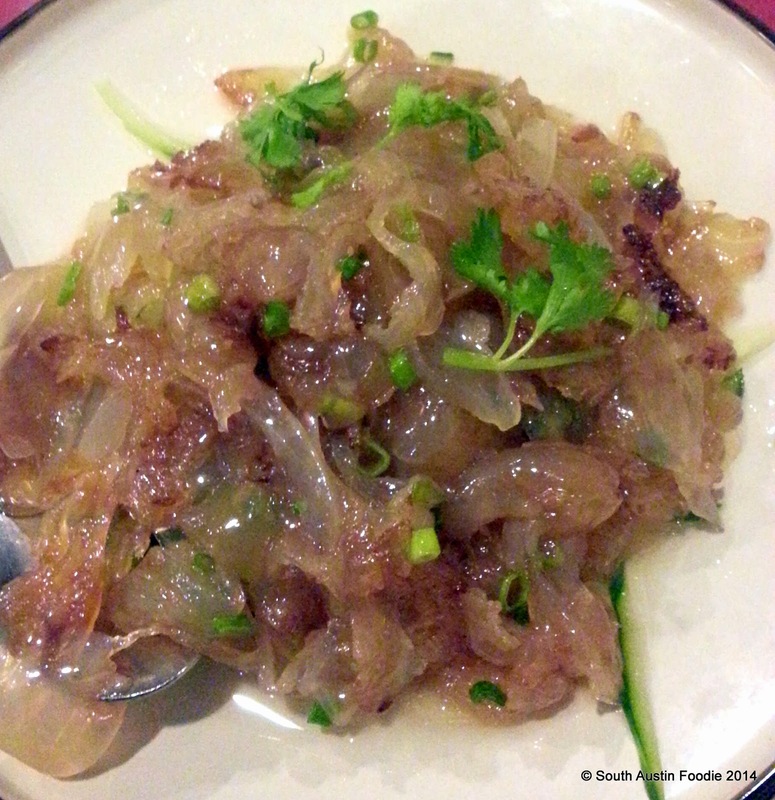 Both were fairly bland, gelatinous, and a touch crunchy, the pig ear more so. You can't really see it, but there was some very nice julienned cucumber slices under the jellyfish. In my defense, my Thai friend didn't especially love them either. I ordered the dan dan noodles, which I had been tipped off by the butcher that they were good, but NOT on the printed menu. Oh, no problem, said the waitress. 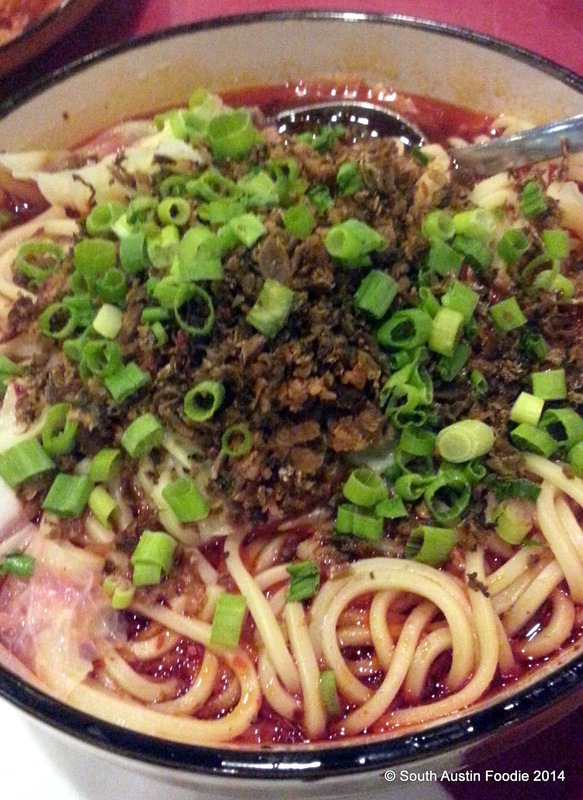 Now, when I've had dan dan noodles in the past, they've had a decent amount of ground meat with them. These did not, but they did have the nice chili oil, a mild Sichuan peppercorn flavor, and a nice firm quality to the egg noodles. I would definitely get this again. The third trip was dinner with my friends who first introduced me to Asia Cafe many years ago. There were five of us total, and we agreed to order a variety and just split everything. 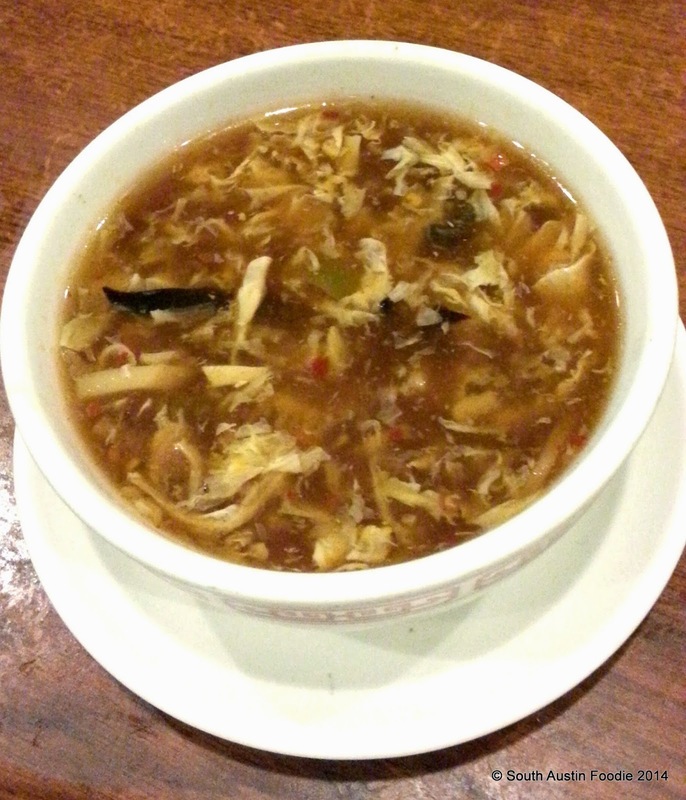 We started with some hot and sour soup, which seemed heavy on the white pepper, but not enough sour for my liking. It wasn't bad, it just wasn't anything memorable. The rest of the meal fared much better! 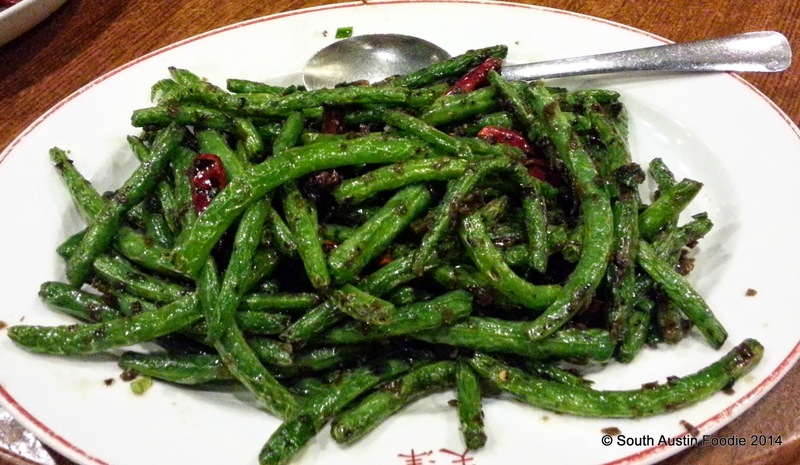 The dry fried green beans were a touch salty, but yummy, and still a bright green (as in NOT overcooked) color. We ordered the eggplant in garlic sauce (just as is, no pork) which was again really good, though the sauce might have been just a bit on the thick side, and I would probably ask for it with pork again. 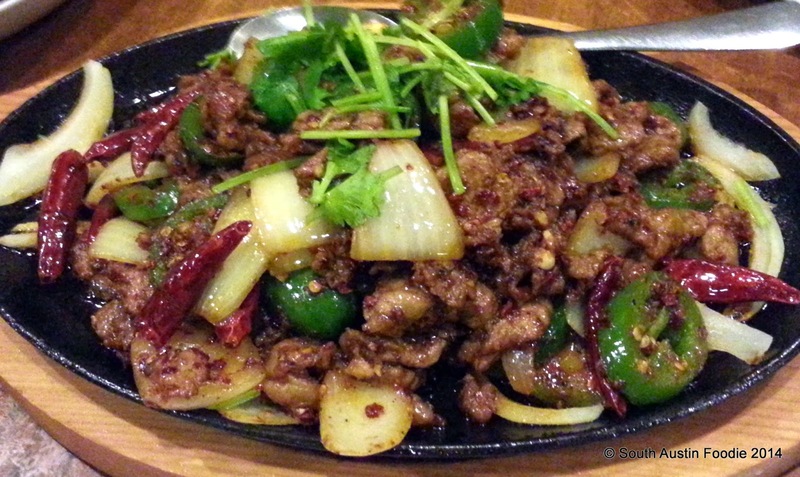 Butcher friend had also recommended the Sizzling Sichuan Lamb, and yeah, it was spot on! It's spicy, though you could probably have them dial it back a bit (see the dried red chiles and the sliced jalapenos?!). And tender. So tender. Very heavy on the cumin (yes, not just for Latin foods! ), and a little bit of Sichuan peppercorn again. I love lamb, so I was very happy. 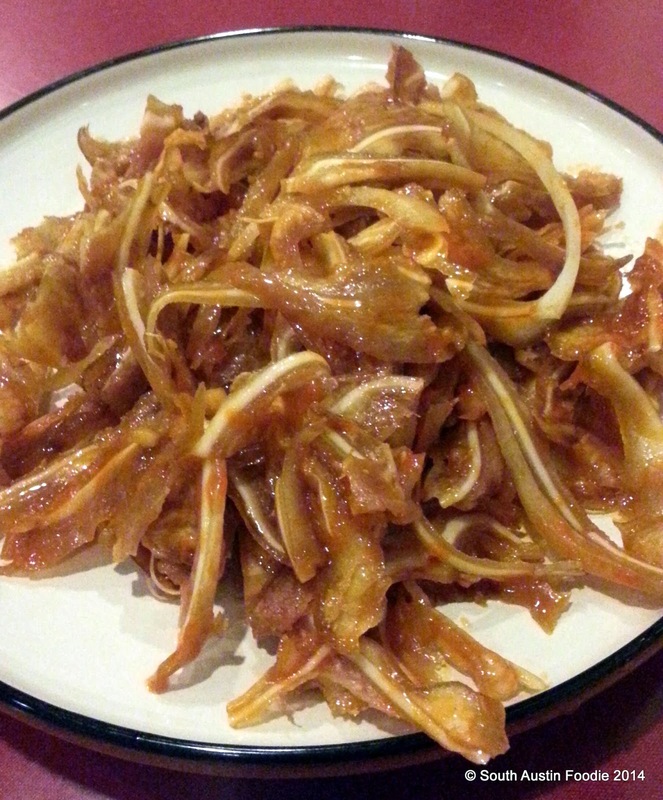 Oh, and butcher friend has always loved Asia Cafe for it's tripe, stomach, and other "weird" parts; he's been extremely happy at Sichuan River so if that's your thing, go for it! My friends are BIG egg foo young fans, so their eyes got REAL wide when they saw it on the menu, so we ordered the pork version. This did not disappoint, and they went as far as to say it was the best EFY they had had in a very very long time. It was crispy, because they serve the sauce on the side -- genius! And what is EFY, you might ask? Think of it as the Chinese version of an omelet. And really good. Our final dish was jumbo sesame shrimp. On the plus, the shrimp were lightly crisp, but on the negative, the sauce was just way too thick and almost cloyingly sweet. Someone had a very heavy hand with the cornstarch in making the sauce. Shrimp good, sauce not so much. The nice thing about having a larger group of people, is not only can you try a variety, but the cost seems to go down. We paid $15 each, and that included tip. And while they seemed a bit short handed (but all the food came in a timely manner), the only other real drawback that we noticed was the lazy susan at our table could really use a good scrubbing and re-coating of protective oil; it was clean but sticky/tacky. Why am I so excited to have a Sichuan place in South Austin? I believe it's the first place really serving authentic Sichuan (Szechuan/Szechwan) down south. And they're not heavy on the Americanized Chinese dishes, though they do have some if that's your thing. And on this Saturday night, the clientele was two-thirds Chinese, and by the time we left, they had a good-sized crowd. And they are close to my work, so I see more nights of eggplant with pork in my future. Both times I have eaten there, I've had the same waitress who is very good, and speaks good English and has good humor. 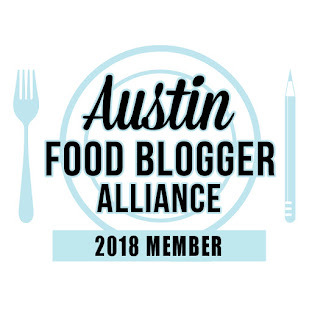 I am starting to hear a bit of a buzz about Sichuan River, and for those of us in South Austin, this is a great addition to our food scene. I love Sichuan River- three good meals there in the first week they opened. 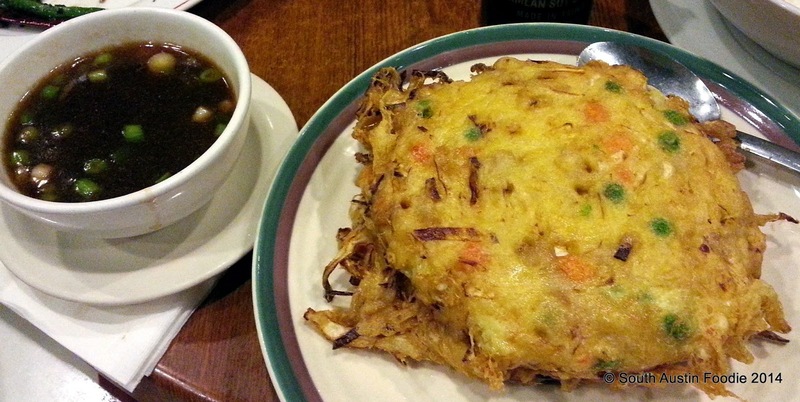 I am also a big fan of egg foo yong, and had the shrimp version last week. Unlike my beloved Bamboo Garden's version, SR deep fries theirs making it very crisp. Loved that, and the fact that the brown sauce was on the side, rather than floating the raft of eggs. The seafood soup is very light, and while I don't like the fake crab they use, I liked the soup. There is a lot of good shellfish and a clean clear broth. 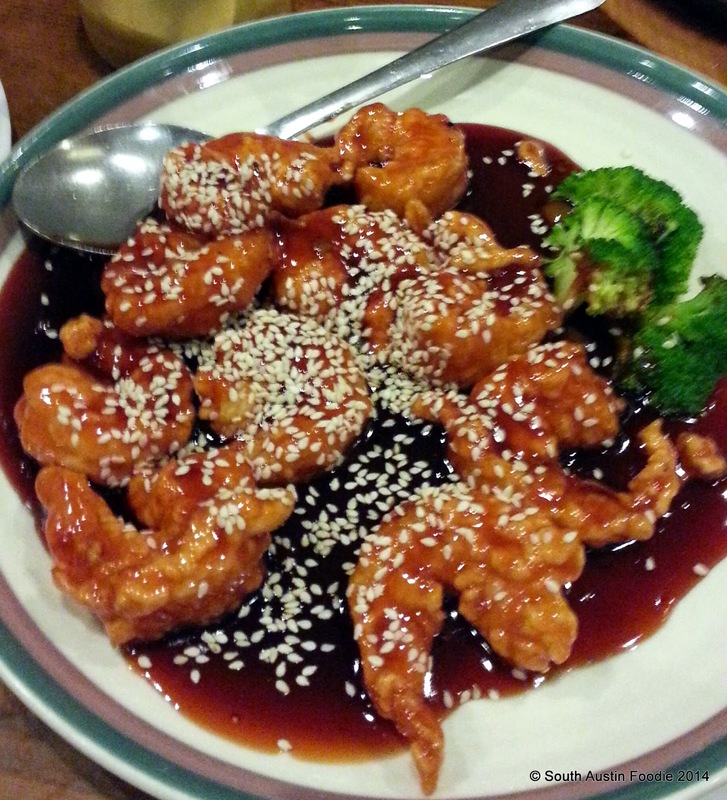 The sizzling shrimp was tasty, but the sticky sauce and unpeeled shrimp will keep me from ordering again. I found remnants of the sauce for hours afterwards. Perhaps my favorite dish there (and I have had the eggplant, good but a tad sweet for my taste) is the baby bok choy with black and white mushrooms. The bok choy is small enough to be tender and easily consumed with chop sticks and the mushrooms are delicious. The plating was lovely too, very geometric and different both times I ordered it. Suzanna, I think we had the same waitress, and a good description. Did our butcher friend say her name was Ann? I also had a lovely waiter's attention the first time we were in, named Michael. 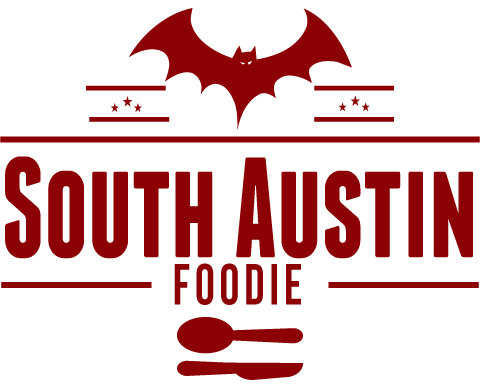 I agree, a terrific addition to out South Austin repertoire! I'll have to try the bok choy - thanks for the tip! I think the waitress with long dark brown hair is Mary (per the Butcher!). Ugg, I want dan dan noodles now. Meet for din din & have dan dan sometime? Oh man I hope they are veg friendly, there isn't any good Chinese food down here!!! Lazy Smurf, please let me know what you find out! Also someone commented on my FB page that Hunan Lion in the Brodie Oaks Shopping Center is under new management and is also doing Szechuan food. I went back last weekend with a bunch of foodie friends and everyone highly approved of the food! We ordered all of the stuff I have had before as well as the mapo tofu, which was quite good!